Have you heard about mama cloth? 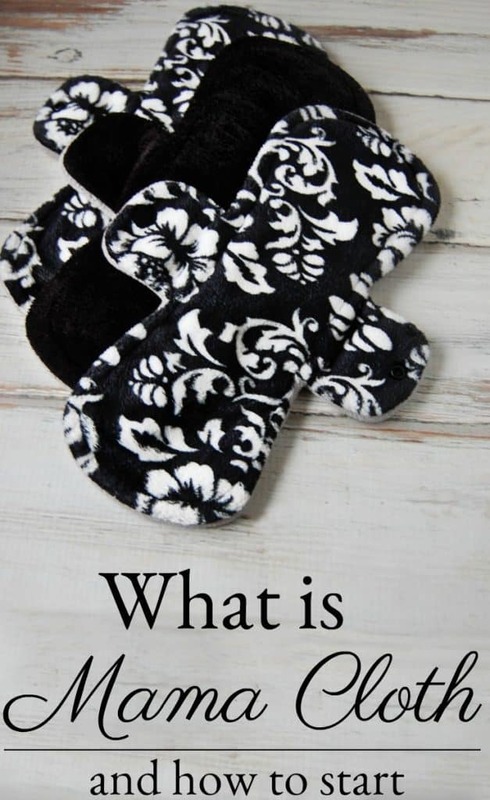 How about by its other name, cloth pads? If you’ve never heard of mama cloth before, don’t worry. It was a few years into my natural living journey before I first heard about them! Today I’m going to tell you about them, the reasons why you should switch to mama cloth, and just how to go about starting! Men, in case you are reading… this post is not for you. Feel free to move on! Mama Cloth is the fun name for cloth pads. In case, you haven’t put two and two together yet, cloth pads are the reusable version of menstrual pads. Now I know that might seem a bit gross at first but it really isn’t all that bad. If you are a mom then quite honestly, this doesn’t even come close to a diaper blow out. If you aren’t a mom…well I guess you might have to get used to the idea but it really isn’t all that gross. Saves money – buy your mama cloth stash and never have to worry about that last minute run to the store! Reusable – No need to create any more waste. No toxic chemicals! – The chemicals in disposable pads are pretty nasty! More comfortable – made from a range of fabrics from super soft minky to eco-friendly cotton. Range of sizes and absorbencies – mini, thong, overnight, postpartum…lots of options! Reduced cramping – Due to the lack of chemicals, some experience less cramps! Lighter periods! – Once again, due to the lack of chemicals! Fun colors and prints – because why not have a bit of fun with such an annoying time of the month? How Much Mama Cloth Do You Need? A good rule of thumb is to take the number of disposable pads you currently use in one cycle and then multiply that number by two. So if normally you use 6 pads in one cycle, you’d want to buy 12 cloth pads. This amount is if you want to wash every 2 days, which many say is the longest you should go between washings. (much like cloth diapers). How To Use Mama Cloth? Mama Cloth is just like any pad. You simply lay one in your underwear, snap it into place and you are ready to go. When you need to put on a new cloth pad, just unsnap the dirty one and put it in a wet bag (many women keep a wet bag in the bathroom). Snap in a clean mama cloth again. Simple. Most recommend rinsing your dirty mama cloth under cold water before tossing in the wet bag. Many women just toss in their mama cloth with their cloth diapers. If you do not use cloth diapers than you could just throw your mama cloth in with the towels. Wash in cool or warm water and tumble dry. Not too hard. Most women store their mama cloth in the bathroom for obvious reasons. They keep them in a drawer, basket, or even in the dry section of a wet/dry bag. If you are out of the house, don’t worry you can still use mama cloth! Just pack your clean cloth pads in a wet/dry bag and store in your purse. When you need to change your pad, put the dirty one in the “wet” section of the bag and pull out a clean pad from the “dry” section. No big deal. There are of course, tons of places you can find mama cloth. I buy my mama cloth from Pink Lemonade Shop. Their mama cloth is of great quality and comes in so many colors, patterns, and fabrics that it’s hard to not want to buy them all! Pink Lemonade Shop also sells wet bags and wet/dry bags! Not a pad type of girl? Then you’ll want to check out the eco-friendly alternative to tampons! I just made the switch thanks to EarthGirl Pads (bought via Etsy). I'm actually looking forward to my monthly this time around! I've always gotten rashes- think like a diaper rash on a baby- and simply assumed it was because I didn't always change often enough. Now I'm sure that it is the large amount of chemicals that we're giving me issues. Okay this looks like something I would be willing to try, but I have a serious newbie question… do you worry about any stains when washing or is this different than when you normally have blood on clothes? I would love to try and switch over to this method. I have never used cloth diapers before although I wish I did. Any help and tips would be great. Thanks. Staining depends on the material of the mama cloth. I have minky material and it doesn’t stain at all. Cotton would likely stain or you’d have to be very proactive about stain removal. But if you go with minky, you really shouldn’t have any issues. Would these pads help with light urinary incontinence? I just checked out Pink Lemonade…nice products. Looks like it would be fun for a girl who is just beginning to menstruate to try these. Ive been using them for almost a year. Though i bought mine from wish. I wont go back to the other kind. I love it. Only problem i have with the ones i have, it seem to get hard in the center over time. I only have 3 so i wash each immediately. It is not true that exterior chemicals cause cramping and heavy periods. Have you ever been to a gynecologist? I guess you just make this stuff up all on your own, right? While it may not make a difference in cramps for ALL women, switching to mama cloth definitely has helped many women with their cramps. COMMENT I experienced the worst pain of my life using a store-brand tampon one cycle. This led me to alternatives and it is how I ultimately discovered menstrual cups and reusable pads. I never had pain with my cycles until I had kids. But I can say without a doubt, the switch to a cup and reusable cloth pads has shortened my period by 2 days and cut my cramps down to a day or less. Truly. I love mine! I kinda rushed into them and bought some on Amazon (I know, I know) but I think I’ll treat myself to some from @guildedrosestudio. Thank you for the great info!